Cold Noses, Warm Hearts, the Iowa City Animal Care & Adoption Center’s foster care program, is funded in part by donations from you to Friends of the Animal Center Foundation. Your donation helps fund foster care coordination, training and educational materials for foster parents, medications, and supplies a foster parent needs to care for an animal. Foster homes are needed for both cats and dogs, kittens and puppies. For more details on the Foster Program at Iowa City Animal Center please visit their website. We provide funding for kitten milk replacement, heating pads, kitty havens (caging), and more. If you are interested in becoming a foster home please contact Lisa Bragg. A momma cat and her seven kittens, just three weeks old, came into the Animal Center and were all diagnosed with ringworm. While not fatal, ringworm is highly contagious to other animals and humans as well. Momma cat and her kittens were able to live with a foster family who quarantined them and treated the ringworm. The kittens returned to the Animal Center healthy and ready for adoption. One of these kittens was Steinway. He went to his forever home in July and is living a happy, healthy life with kids who adore him! 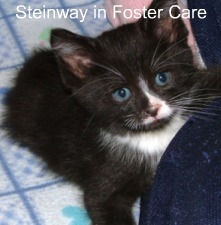 Donations to FACF helped pay for Steinway’s ringworm treatment and supplies in foster care and allowed a kitten who might otherwise have been euthanized a chance at a long life in a loving home. Houdini and Oscar arrived at the shelter as strays at 5 weeks old, and both were diagnosed with upper respiratory infections. With the combined support of the staff, FACF, and volunteers, these adorable brothers were placed in a foster home, where they could receive medication, care, and socialization until old enough to return to the shelter for adoption. Their foster mom, Heather C., told us, “This is my first time fostering and it’s been a great experience. It’s a joy to see them healthy again, roughhousing with each other, learning to climb and play with toys. When they get worn out, they both become little purr machines. It will be wonderful to see them find families of their own.” We are happy to report that these two special kitties have been adopted! 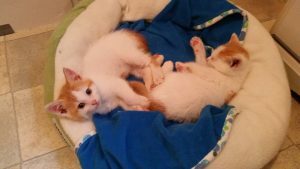 Donations to FACF helped pay for the supplies needed to give these two special kittens a second chance!